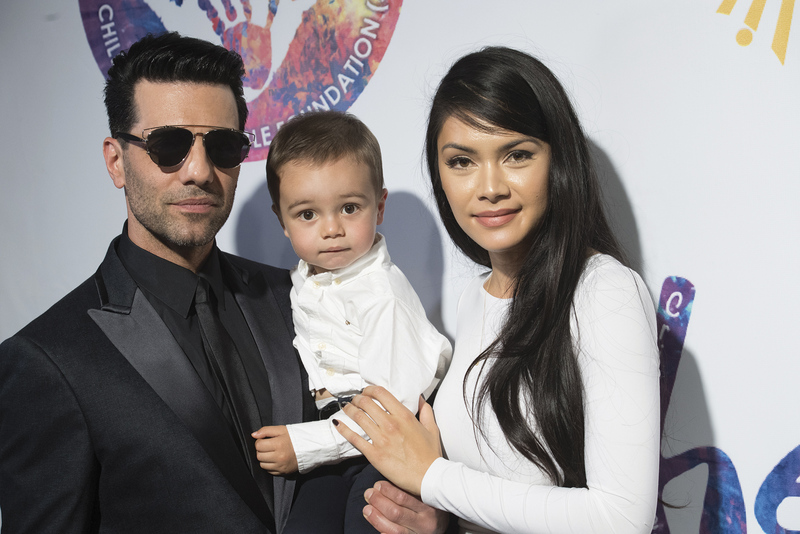 Before Criss Angel became successful, as far back as 2001, he supported children’s causes. “I’ve always, in my whole life, done things for kids,” continued Angel. “I’ve always had a soft spot in my heart for children; and I always empathize with them. But with little Johnny, it’s taking it to a whole other level. “I’m much more sensitive. I look at life differently. I don’t get caught up as much with the things that don’t matter …. What matters to me are the people that don’t have a voice. What are important in life are the things you can’t buy — love, health and happiness. Of course, Angel always has been about family. “Without a question, my dad was … my greatest inspiration in my life,” said Angel. “When I’m with Johnny playing, talking with him, I remember back to what my own dad, John, taught me that I’m now passing onto my son. “My dad was an incredible man, and if I could be a quarter of what my dad was, I’d be thrilled. I even emulate some of the photos that my dad did with me as a kid. I remember those times of how much love my father gave me, and how he tried to bestow a better life on me than the life that he had as a child and so, obviously, that’s what I’m trying to do for my son. “I obviously want him to grow up and appreciate people. He’s a very special boy. I know everybody says that about their kid but, mark my words, 10-15, 20 years from now, my son is going to be somebody who’s going to do wonderful things, and he will be way bigger than I ever was. Having known Angel for more than a decade, this was the first time he laid his emotions raw. The “Mindfreak” image we all have of him — a character, a creation of his mind — is what we see when it comes to his onstage and TV magic, but that’s not who he really is. “I’m Christopher. Criss Angel is an extension of one part of me, not my whole me,” he revealed. “Christopher is who I am right now, who I am with my son; somebody who has a lot of love for people, and for giving, and for appreciating, and for values. “Now, because of the situation and because I think this is my greater calling in life—to be a voice for these children, I believe that it’s important for me to be able to cry in front of people, to be able to show how my personal life is really and profoundly affected. “I’m not ashamed of that because, if I want to bring attention to children who are going through this horrible disease, I must be transparent and allow people to see that, because that’s what they’re going to connect to. Not an illusion, but reality. Angel forfeited a week of his Cirque du Soleil shows when he ew to Australia immediately after Benson told him of their son’s medical diagnosis. We were curious how Johnny copes with the 8,000-mile 17-hour-flight distance between their homes in Melbourne, Australia, and Henderson, Nevada, and if he’ll eventually get to spend more time here. “I see Johnny more regularly now that he’s in with what’s called ‘maintenance,’ a monthly hospital visit to get his blood checked, but he’s still doing chemo administered no matter where he is. I see Johnny, obviously, coming out here very often. We both share equal custody, and we both want each parent to be in Johnny’s life because he deservers that as much as possible. “I went to Australia three times in the month that he was being treated, and now he’s able to come here frequently. He’s my son, my love, my passion, my family, my blood — I desire to be with him as much as I possibly can and (his mother) feels the same way. Millions marveled when he walked on water — more than 40 mil- lion, to be exact. Even more were dazzled when he floated down from the spotlight atop the Luxor pyramid. He hung by meat hooks from a helicopter over the Grand Canyon and was attended by a steamroller — and lived to tell the tales. The illusions and magic brought him worldwide fame, as well as the usual aggravation of avaricious agents and lousy lawyers wanting to pro t of his name and earnings. Coming from street magic, sawing a woman in half and sleeping in your car instead of a motel on arrival in Las Vegas let’s you scrap for success. 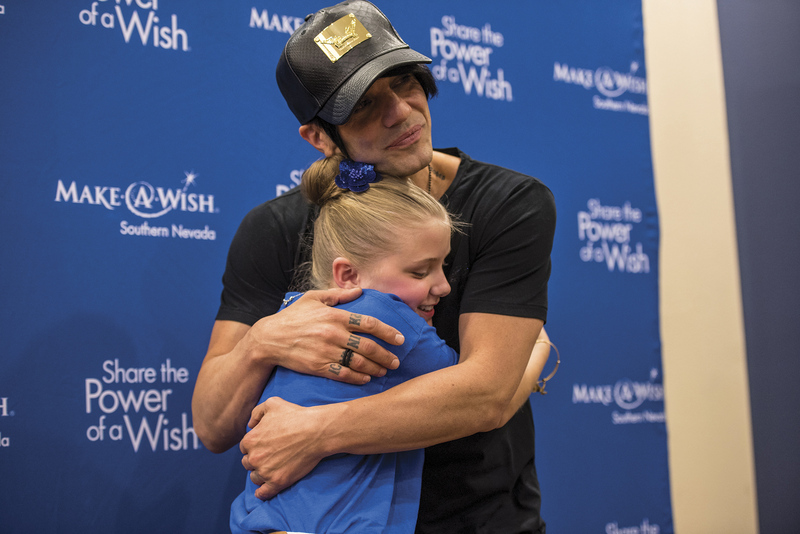 It also explains why out of the glare of cameras, Christopher Sarantakos, aka Criss Angel, will perform two shows a night on the Strip, then spend hours packing up a truck with toys for kids and deliver 5,000 bicycles paid for out of his pocket to a local toy drive. But no challenge Angel met ever shocked or surprised him until doctors told him his newborn son, Johnny Crisstopher, suffered from a devastating form of pediatric cancer. In his armada of illusions, there was no trick up his sleeve to conquer that acute lymphoblastic leukemia that ailed Johnny. So Angel, who has adored kids and anonymously — out of the spotlight —given generously to Make-A-Wish America for more than 15 years, rolled up his sleeves to show another side of himself. Critics and lesser magicians jealously have accused Angel of out-of-this- world arrogance, divisiveness and stealing other’s tricks. Yet the transition from gothic rebel rouser, to proud parent and man with a mission to conquer childhood cancer didn’t surprise those who truly know the man behind the magic, because he’s been quietly doing that without fanfare for more than a decade. But he did stun his “loyals” and showbiz pals when he turned up unrecognizable on the red carpet of his recent H.E.L.P charity fundraiser. Gone was the scruffy hairdo, the gothic look, the macabre black eyeliner and mascara, and in its place was a new, suave, sophisticated and clean- cut Angel, who looked as though he was out of the pages of an Italian men’s fashion magazine. Veteran comedy-actor Jerry Lewis, who has raised more than $2 billion for Muscular Dystrophy, and pal Tony Orlando stunned Angel onstage, anointing him to keep the legacy of charity alive. “I’ve never seen Jerry give that to a young man to carry on, to help cure pediatric cancer, just like Jerry did. Wear his shoes well,” Orlando said to Angel. The change in Angel was so dramatic, not even his friends realized it was their pal the “Mindfreak” behind the fancy sunglasses until he spoke. Now fans are getting to see Angel as he really is: not a character, but a loving, caring gentle giant who is determined to change the world of pediatric cancer. Angel spoke to me exclusively for Luxury about his son’s progress in the fight against leukemia. “I just took him to Disneyland, and he’s in remission. He continues to thrive despite the chemo and mood swings. He’s doing really well according to his doctors. He’s an incredible kid but, for three years, he still has to do chemo on a daily basis with steroids,” said Angel. “It’s becoming very difficult to watch because you see your son turning into another kid for 90 minutes; he would not stop violently trying to bang his head. A lot of parents that have children going through cancer stop giving them the steroids because they don’t want their child to turn like that, but the problem is, that it’s such an important part of the treatment. Angel and Australian model Shaunyl Benson had dated quietly for two years here in Las Vegas, but she returned to Australia to have their baby, Johnny Crisstopher. “Honestly we are really good friends,” said Benson about her relationship with Angel. “Everything is beautiful. Angel wiped away a tear and continued, “It’s made me realize what’s important in life more than ever. It’s so vital (for us) to use this situation to be a voice of these kids, and to really try to make a difference in their lives today and in the future. “In 2001 through today, before I had Johnny, I would meet those parents and kids (suffering with cancer). I couldn’t really relate to them and what they were going through because you can’t unless you go through it yourself. Now that I am going through it, my perspective as a parent is very different, and I can relate to how difficult it is for the family and for the child. “That’s where my motivation comes for wanting to make this documentary, “Ten Ninety Five,” referring to 1,095 days of medicine, when Johnny’s done with his treatment. God willing, we’ll release it.